Tractica Research forecasts that AI software revenue will reach $36.8 billion by 2020. Any work pushing the technology envelope, from analytics or healthcare, to scientific and technical, even aspects of media and entertainment, has big data at its core. 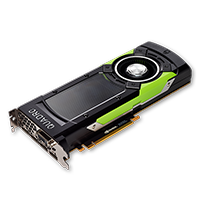 More than 19,000 companies use NVIDIA enabled deep learning, and the Quadro GP100 is an ideal development platform compatible with industry standard workstations. Only the NVIDIA Quadro GP100 offers the mixed-precision compute performance required for cutting-edge Deep Learning (AI) development, and an active fansink thermal system, a necessity for industry standard workstations that only accept actively cooled boards, not passively cooled products intended for server deployment. Additionally, its fast FP32, FP16 and INT8 performance makes it an ideal desktop workstation solution for developers working on the latest Deep Learning/AI frameworks and associated developer tools.